The battle for Tripoli rages on, the bishop of Cloyne breaks his silence, Ireland’s latest viral sensation and… can we turn light bulbs into wifi routers? 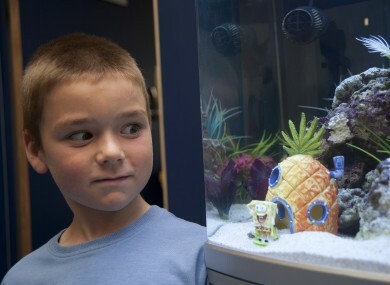 Sean Graham, 7, poses with a €500 aquarium he won from Sharkey's Cuts for Kids hairdressers. Today he donated the aquarium to Temple Street Children's Hospital for the enjoyment of its patients. EVERY EVENING, TheJournal.ie brings you a round-up of the day’s biggest stories, as well as the bits and pieces you might have missed. The battle for Tripoli is continuing this evening, as pro-Gaddafi loyalists try to defend the presidential palace while rebel forces take command of the bulk of the city. The head of the rebel council says the “real” victory will come when Muammar Gaddafi is captured – though his whereabouts are still not known. Earlier rebels said they had captured a third Gaddafi son. Ireland’s foreign minister Eamon Gilmore has described the rebels as “the only authority” in Libya. The bishop of Cloyne, John Magee, has broken his silence on the findings of the report into clerical sexual abuse in his diocese. He told RTÉ that he felt “ashamed” of the abuse, and that he accepted full responsibility for the failure to investigate claims of abuse. Ireland’s two ‘pillar banks’ were given almost €8 billion in emergency loans from the US Federal Reserve at the height of the banking crisis, stats obtained by Bloomberg have shown. AIB’s peak borrowings were nine times larger than the value of the bank itself. WLRFM says the sperm whale that washed up on a beach near Dungarvan at the weekend, and died on Saturday, will be disposed of tomorrow. It’s being brought to a rendering plant in the city. Declan Kidney has named his squad of 30 for next month’s Rugby World Cup in New Zealand. There’s a couple of high-profile absentees, with scrum-half Tomás O’Leary and utility back Luke Fitzgerald not making the cut. Here’s The Score’s gallery of the 30 making the plane, and analysis of why some veterans were left out. A man has been arrested in Wexford after the seizure of cannabis worth over €330,000. The first round of CAO offers were published this morning – and showed a rise in the points needed for courses in science and IT courses, but a fall in points for arts courses. Students going to UCC may want to take note of a new business that’ll give you dinner four nights a week… for a tenner. Dublin photographer Nicola McClean was in New York on September 11, 2001. As the 10-year anniversary of the attacks approaches, she has opened a new exhibition featuring some of her photographs from the day and those that followed. Here’s a look at some of her work. Yes, it’s Rose of Tralee time – so in case you missed it last week, here’s our guide to the 32 Lovely Girls (sorry, we promised we wouldn’t do that) in this year’s contest. This, we swear, is an actual headline: Richard Branson’s house burns down – but Kate Winslet escapes. Have you met Ireland’s latest internet superstar? Introducing… a lonely penguin from Fota Island. If you think the X Factor’s Janet Devlin is the latest Northern Irish singer making waves, you may want to catch up with what’s been happening on The Glee Project. Spoiler alert to be found over here. Finally this evening, from the ever-brilliant TED, comes a talk from Harald Haas… who reckons we could revolutionise how we use wireless data by turning every single light bulb into a wifi router- simply by changing the lightbulb.